Echoes of The Godfather just refuse to fade away. Every director fascinated by organised crime and family dynamics wants to have his (not yet her) own version of this Mafia classic in his filmography. Some like Ram Gopal Varma and Prakash Jha pay direct character and scene-lifting tribute, some like Anurag Kashyap are influenced by the spirit. 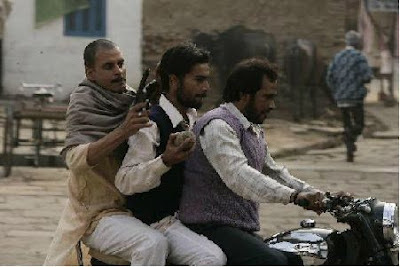 His Gangs of Wasseypur, an ambitious, sprawling, dark, untidy epic, takes audiences into the unsanitized environs of the coal belt of North India, fabulously shot, amazingly cast and performed, but tells the over familiar story of rival gangs, and the politician who stands to gain in the “Bandar baant.” Unfortunately, the people for whom a viewer feels compassion and wants to know more about – the exploited coal miners—are given short shrift. The film opens with the calm of a family watching a TV soap being shattered by gunshots, and the violence never abates. The social reality of Dhanbad changes (and there is a brisk historical background provided by a narrator’s voiceover) from the times of the British, to the post-Independence new industrialists, to the coal mafia to the “thekedars”and “bahubalis”. What do not alter are the bleak landscape, lawlessness and unbridled machismo. Sardar Khan (Manoj Bajpayee),who wants revenge against the murder of his father by crooked politician Ramadhir Singh (Tigmanshu Dhulia), is shrewd and ruthless. His main rival Sultan (Pankaj Tripathi) belongs to a clan of butchers, who are proud descendants of the notorious Sultana Daku. It doesn’t really matter who is killing whom and why, they are all criminals, who parade around without fear, because even the cops are afraid of stepping into that area. The murders are not just shootings with country pistols; they involve chopping the victim’s body to bits and throwing into the nearest rubbish heap. The women, even though are marginalized in this kind of rugged, macho society, hold their own. If Manoj Bajpayee is brilliant as Sardar, Richa Chaddha as his sharp-tongued wife is superb. She stoically accepts his philandering, but keeps his libido in check at home. Nawazuddin Siddiqui is the flavor of the season, but Tigmanshu Dhulia in his acting debut brings the character of the slimy politician to life. Gangs Of Wasseypur has so much going for it, the locations, costumes, lines, music (aninspired Sneha Khanwalkar), but for all its cinematic excellence is ultimately unrewarding viewing. The violence is excessive, and it is impossible to root for any character. The Godfather had an elegance and sense of honour in the midst of all the savagery. Gangs of Wasseypur is just unrelenting barbarism.